We are looking for a candidate who is legally authorized to work in the US, to fill the Microsoft Dynamics AX Trade and Logistics Consultant USA position. To express interest in this role, please email us at info@365talentportal.com. 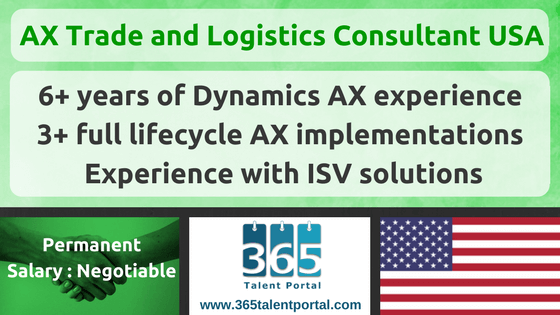 To get notified of Microsoft Dynamics positions that suit you, please register with 365 Talent Portal. 365 Talent Portal is the online platform that enables thousands of Microsoft Dynamics consultants & Microsoft Azure consultants to improve their Dynamics careers and their technical, consulting, and soft skills, as well as advertise their profiles whenever they choose to look for Microsoft Dynamics jobs & Microsoft Azure jobs. This profile gives the best Microsoft partners and Dynamics end users instant, direct access to the consultants that want to be contacted. With a network spanning 114 countries, 365 Talent Portal allows companies to search for Dynamics consultants based on their detailed skills, rates and available dates, to find the best permanent and independent consultant resources for their projects. Companies can find and employ them via a very low-cost Dynamics recruitment model on either a freelance or permanent basis, without incurring the hefty fees typical of recruitment agencies. 365 Talent Portal ™ is a trading name of 365 RESOURCE Ltd. Copyright © 2017 365 RESOURCE LTD. All rights reserved.